The line had announced in December that the Norwegian Epic would sail seven-night Mediterranean voyages out of Barcelona for the summer of 2012, and that's still the plan. But passengers now also will have the choice of embarking the ship for the sailings in Civitavecchia, the port for Rome, as an alternative to Barcelona. 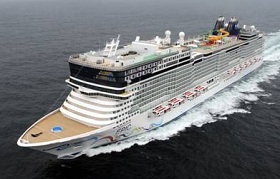 Rome already was one of the four port calls scheduled for the seven-night Norwegian Epic sailings out of Barcelona. The other stops are Livorno, Italy (for day trips to Florence and Pisa); Nice, France; and Marseille, France. The itinerary for the sailings isn't changing, and passengers who board in Rome can expect the same experience as those boarding in Barcelona. The only difference will be the order of ports. Passengers who board the Norwegian Epic in Rome will disembark the ship in Rome, just as passengers who board in Barcelona will disembark in Barcelona. A spokeswoman for the line notes the additional embarkation point for the sailings adds flexibility for customers. "For some guests, it's easier to get to Rome than to Barcelona," spokeswoman AnneMarie Mathews tells USA TODAY. It also "gives guest the opportunity to do pre- and post-cruise packages in Rome," she says. Mathews also notes the addition of cruises beginning in Rome will allow the line to tap into the local Italian market to fill some cabins. Sales for the new Rome sailings start immediately with a limited number of cabins on the ship available from the city, the line says. The choice of cabins available from Rome includes every category from the smallest single cabins to the biggest suites. Fares for a balcony cabin from Rome start at $1,299 per person, based on double occupancy.